Jackie O has always been associated with pearls… such a classy lady. And although diamonds and rhinestones are fun and sparkly, I typically don’t wear them on clothes, do you? But give me pearls and they make any outfit classy including a simple sweater. I found this fun charcoal gray sweater at H&M recently and was smitten. I plan to wear it both dressy and casual. As featured I am wearing a long tee shirt underneath but love it over a crisp white blouse as well. I paired this sweater with gray frayed jeans and black booties. By the way… did you know that H&M is going after the ageless woman. You can read more here. 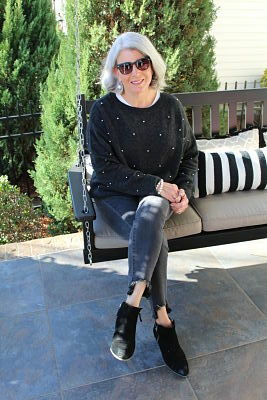 I have linked a number of pearl sweaters (with shopping links) both inexpensive like mine (under $20) as well as more expensive ones, depending on your taste. Do you like pearls on sweaters?